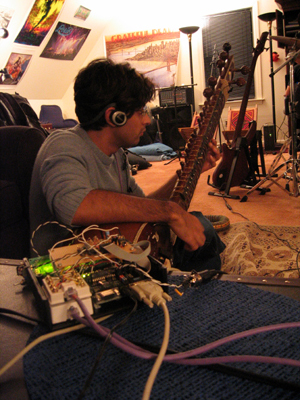 The purpose of this project is to use microcontroller technology to create a real-time instrument that models the Sitar. This Electronic Sitar (known as the ESitar) has digitizing sensors, custom positioned to traditional Sitar technique, which converts human musical gestures to binary code which machines can comprehend. These signals can then be used to trigger real-time sound and graphics. With the goal of capturing a wide variety of gestural input data, the ESitar controller combines several different families of sensing technology and signal processing methods. The specific gestures our system captures data from are the depressed fret number, pluck time, thumb pressure, and 3 axes of the performer's head tilt. 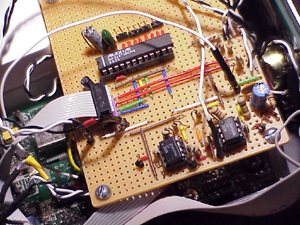 The core of the ESitar's sensing and communication systems is an Atmel AVR ATMega16 microcontroller. "